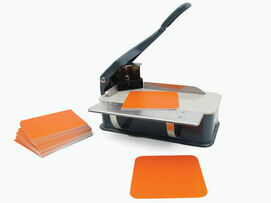 Easy-to-learn engraving machine accessories make your job easier. Once you're familiar with engraving, let us help you engrave faster. Consider these engraving machine accessories, and check out our bevelers and corner rounders too. If you often engrave name tags, then this accessory is a proven time-saver. Clamp a name tag between the rails, engrave, release, replace -- and engrave the next one. The best feature -- it holds name tags with the pin, double post bar or magnet already attached. This allows you to purchase name tags with fasteners already in place, and with imprinted logos, ready for you to engrave the names. This universal device accommodates all of our name tags and clamps to the bed of all Scott Signgraver® machines. This is helpful when engraving square legend plates too. Saves enough time to pay itself in an afternoon. Keep all your Scott Signgraver® engraver machines humming along with the smooth-running, vibration-free motor. 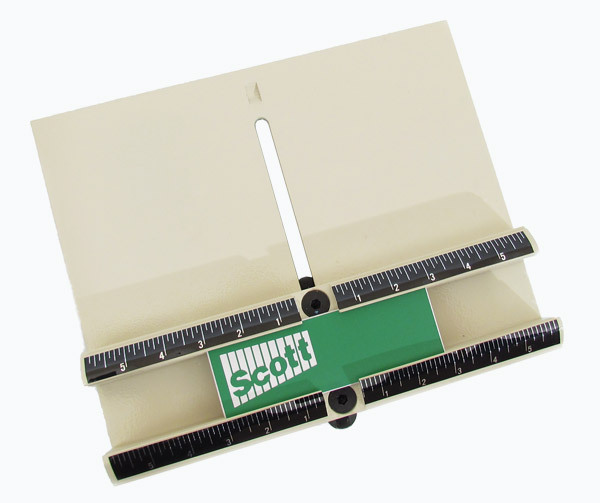 One of our most versatile engraving machine accessories, it's quiet and always cool to the touch. Consider an attractive rounded corner as an alternative to a beveled edge. Place the square corner of your flexible engraving plastic sign panel into the enclosed die, press down, and create a nicely-rounded corner in a single stroke. Change the dies in moments to create these popular radii: 1/8", 1/4", 5/16" & 3/8". Unsuitable for metals and rigid engraving stock. Make a great machine even better. Utilize our full range of engraving machine accessories, from vises for engravers to holding clamps, corner rounders and more. All it takes is a quick call to one of our knowledgeable representatives, to learn how to engrave easier, faster and smarter!